Published on November 29, 2010 in Happenings Now. 0 Comments Tags: Advent, meditation, spiritual life, watch. The theme of Advent is strongly counter to the pre-Christmas mood in the world around us. It centers on the coming of Christ at the End of Time, summoning us to take inventory of our lives and the world we live in, looking at them through the eyes of Christ our Savior. It’s important to set aside a time, even just a few minutes, for quiet and freedom from distractions. Choose a comfortable spot, light a candle (the votive from church if you’ve picked one up),and just be still — no background music or television. 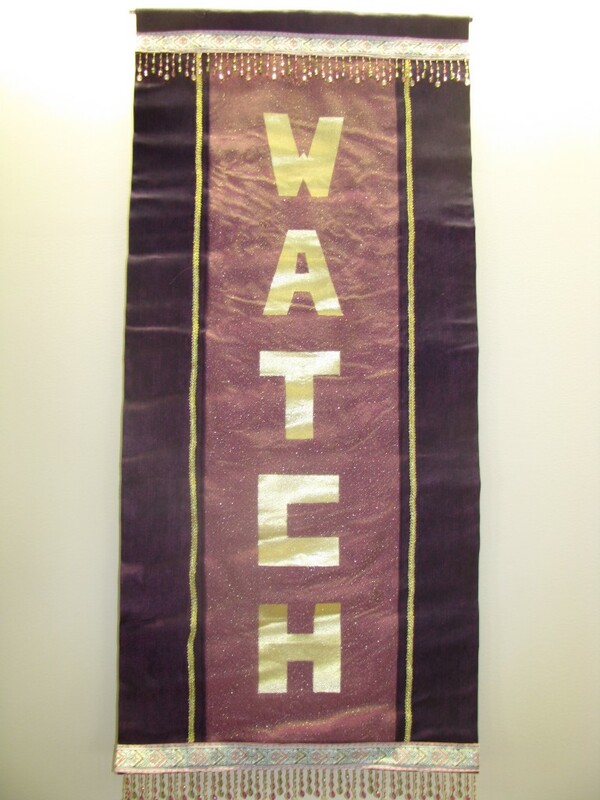 You may want this first week of Advent to meditate on the word from the first of our Advent banners. Watchfulness, wakefulness, anticipation, being prepared for Christ’s coming — these themes appear in the Advent readings for Scripture. You might want to choose one of these, reading it very slowly (preferably out loud), putting yourself in the scene, noting what calls out to you and where the reading leads you: The Necessity for Watchfulness (Matthew 24:36-44); The Parable of the Ten Bridesmaids (Matthew 25:1-13); The Coming of the Son of Man (Matthew 24:29-31). The Buddhist tradition uses the term “mindfulness,” which may be a useful variation on watchfulness. Mindfulness means clearing our mind of the clutter of anxieties and arguments that runs pointlessly through it, and seeking a higher or deeper awareness: 1) of ourselves, how we really feel, what our situation really is, what choices we have; 2) of the world around us, what is going on in it, for good and for ill, how it affects it — and more importantly how we let it preoccupy and burden us to no avail (think of all the time we spend exposed to advertisements or the emotional manipulation of talk radio/television/blogs); of Jesus and how he stands as judge over against us and the world. Don’t try to fit all this into one meditation session! Take a bit at a time, those that are helpful to you. Maybe you have other suggestions. Share them by way of comment on this post. Another source for reflection would be the prophecies that the Holy Cross children work with in their atriums. These can be found in the response to the readings that we gave during the Eucharist on Sunday, November 28.